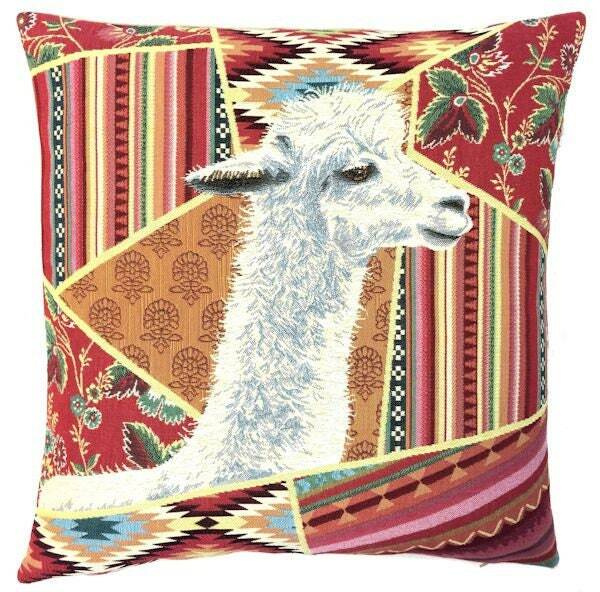 This deco tapestry pillow cover is one of a set of two cushions featuring lamas/alpacas on a boho background. It is woven on a jacquard loom in true traditional tapestry design – a craft that only a few master! The cushion cover is woven with 100% cotton thread and lined with a plain beige cotton backing. Size is 45x45 cm (18'x18'). We advise an insert of 50x50 cm (20'x20'), because we like our covers well filled. Insert not included. Closes with a zipper. Dry clean only. Handmade in Belgium. If you are into DIY, you can also order this design as an unfinished panel and make it into a pillow cover with your own finishing, a tote bag, a chair seat, an apron or you can even frame it. Your imagination is the only limit !